Now a team led by Thomas D. and Virginia W. Cabot Career Development Assistant Professor Gabriela Schlau-Cohen has discovered that a single carotenoid—LHCII—in the major antenna complex of green plants serves as the nexus of light harvesting by accumulating energy and transferring it through a debated dark state. These photophysics reveal how plants expand their capacity to capture and utilize solar energy. "Solar energy devices must absorb a large fraction of the solar spectrum—i.e., many different energies or colors—to be competitive with fossil fuels," says Minjung Son, a graduate student in Schlau-Cohen's lab and one of the authors of a paper on the research. "Absorption of these energies comes with a challenge: How can the high energy be funneled down to the low energy, which is what is used to produce electricity and eventually biomass?" "We mapped out pathways of energy flow that connect the high energy side to the low energy side of the absorbed solar spectrum, including one pathway through a previously-debated dark state," Son explains. 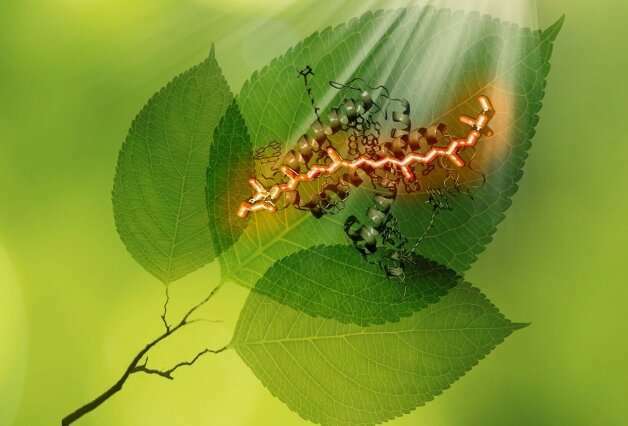 "This map provided a blueprint for solar energy devices that absorb a lot of energy across a broad range, as well as provides an important step in understanding the intricate photosynthetic machinery of plants." The research is described in "The Electronic Structure of Lutein 2 Is Optimized for Light Harvesting in Plants," which is featured on the cover of the March 2019 issue of the journal Chem, which was released online on Jan. 31.